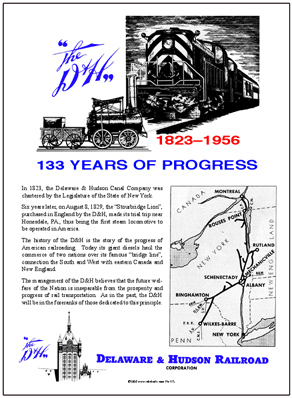 The Delaware & Hudson Railroad was one of Americas first rail lines. Beautiful D&H diesel locomotive along with several D&H Logos used through its corporate history. 6 inch x 6 inch square tin logo sign of the Delaware & Hudson Railroads bridge line logo used on many of its box cars. 6 inch x 6 inch square tin logo sign of the Delaware & Hudson Railroads famous shield logo. Tin sign featuring a great ad on the 133rd Anniversary of the Delaware and Hudson Railroad with system map and Americas first steam locomotive.